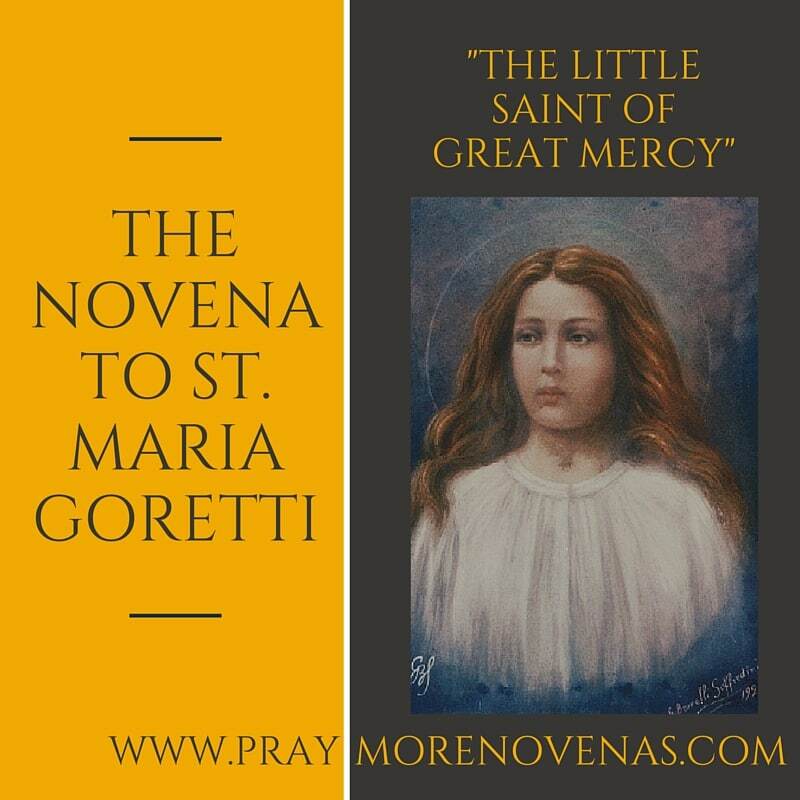 Here’s Day 7 of the St. Maria Goretti Novena! My name is Getrude, during this novena God sent a helper from no where for my brother , who has not gotting a job after ten years he graduate d from the University. I am also believing God for my other intentions. Please pray for my discipleship to serve pur community at The Feast Light of Jesus and continue to be a blessing to my family and especially the poorest of the poor and in need…This I pray with the powerful intercession of St Maria Goretti hear our prayers..in the mighty name of Jesus Amen. I pray today that my children are more like you. Loving God, restore faith in my children especially Your commandments, as St. Maria has in her young life. I pray my sons increase their faith in seeking You and Your will to be done on earth as it is in Heaven. I suffered a horrible auto accident more than 30 years ago and have almost 40 surgeries. I have prayed for so many years for relief from my pain. I have prayed and have come to pray that I suffer for Him. Help me, Lord, to bear my pain, for Your will, in Your Glory. Help me, St Maria Goretti, to bear this suffering as you were able. St. Maria Goretti, thank you for your example of how not to complain about your horrible wounds and suffering. Please ask Jesus to guide me to being strong and offering my RA pain to Him. Please guide me and my doctors to help conquer the problems I am facing with this health issue. Thank you for the blessed health and meds for the past 16 years. Please bless my children, grandchildren, and husband. Thank you for many blessings. St Maria Goretti, please pray for us for the problems we are encountering right now beyond my control particularly the summons and litigation we received due to the car accident of my daughter. Please touch the hearts of the people suing us and for the people involve on this process, that they will be enlightened of what they are doing. Help us also to understand your Holy Will, as we also offer the financial burdens that come with it and our deliverance. Jesus, I trust in you, and all glory to your name! I have severe depression and anxiety. I suffered an emotional breakdown after the death of my youngest brother. I am in default on my student loans, I have no relationship with my family and my father and I are not on speaking terms. I struggle everyday to justify why I should go on when so many people over the past year have hurt me so deeply. Please heal my heart. Please help me to forgive those who have hurt me emotionally so I can finally move on with my life. Please help me to find hope. incontinent issues and mindset and body issues . I pray that you intercede on my behalf to The Lord Jesus Christ to cure me of my many afflictions . I pray for God’s Mercy , Love ,Compassion and Divine Intervention for myself and those that are dear to me . Forgive me my trespasses and keep me always resilient to The Word Of God . For the souls of Jim, Tommy, and Clarence, that they are in heaven with God. Also, for comfort for those who are mourning their loss. Please pray for my brother who is an engineer, to have a safe and fruitful flight on the three days that he will be travelling, without any defect on any of the parts of the aircraft. I make this prayer through the intercession of St Maria Goretti. Ipray that my family and myself will live a life like Marie Goretti.